Designed specifically for the discerning astrophotographer or visual observer, Meade Instruments Series 6000 refractors offer incredible optics and ultra-precise crayford-style 10:1 dual-speed focusing and optional 2-element field flattener. Also included are full-sized cradle rings, Series 5000 die-electric coated 2 inch star diagonal with 99% reflectivity and a custom hard carrying case to keep that beautiful new telescope looking impressive for years to come. The LX80 Multi-mount operates in three modes, German equatorial, single OTA alt-az and dual OTA alt-az. Setting up in any mode is quick and easy. The LX80 is built around a solid aluminum structure, with two large, tapered roller bearings that handle radial and thrust loads on each axis to carry larger loads up to a total payload of 40 pounds In EQ and altaz modes and up to 75 pounds in dual OTA mode. Its precision worm gear drives on both axes deliver smooth, accurate motion and Meade’s proprietary SmartDrive™ provides periodic error correction that dramatically reduces errors providing performance only available on much more expensive mounts. Both the primary and secondary OTA dovetail plates are industry-standard for maximum compatibility with all of your OTAs. The LX80s computerized GoTo mount is controlled with the amazing AudioStar handbox with Meade’s exclusive Astronomer Inside audio descriptions of the objects you are viewing. Slew speeds: RA and Dec:1x, 2x, 8x, 16x, 64x,128x sidereal and 1.5°/sec., 3°/sec., 6.5°/sec. With large two inch diameter stainless steel legs, the all new LX80 tripod is rugged and stable. Built-in fine-tune leg levelers at the top of each leg make doing small adjustments the easiest they’ve ever been. With the LX80’s industry-standard saddle, there is virtually no limit to the different tubes that can be used. Adjustable-height tripod with 2 inch stainless steel legs. Includes fine adjustment leg levelers on each leg. Range of fine adjustment for each leg + 0.2 inch. Tripod height adjusts from 30.5 to 47 inches. 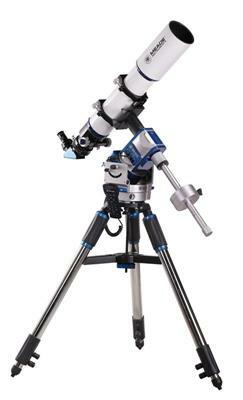 Click the button below to add the Meade LX80 Series 6000 115mm ED Triplet APO Refractor w/Multi-Mount to your wish list.